The 2018 Taichung World Flora Exposition aims to reflect the intimate relationship between humanity and Mother Nature and listen carefully to the messages from it. The event is currently in preparation and schedules to take place from Nov. 3rd, 2018, to April 24th, 2019. Taichung City Government invited Tzu Chi Foundation and DA.AI to demonstrate the power of environmental protection in the Wai-Pu Campus of the Exposition. Tzu Chi Taichung volunteers consulted DA.AI to help setting up the environmental education pavilion to better demonstrate eco spirit during the flora fair. 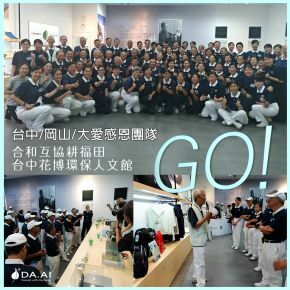 Moreover, Tzu Chi Taichung volunteers visited the Kaohsiung Environmental Protection Station on May 31st to learn how to operate DA.AI’s production simulator machines, which will be showcased in throughout the expo for all visitors to see the amazing process.